I know you have been following the accounts of the complete and utter devastation that has been visited upon our brothers and sisters in the Florida Panhandle by that vicious Hurricane Michael—and wishing you could help somehow. Here in Mississippi, we particularly feel the need to help these folks because so many of them were SOOO GOOD to us when we were obliterated by Hurricane Katrina. Locally, the Queens have been gathering quantities of cleaning supplies and other items we know are greatly needed—and in very short supply in the affected areas. This is great—but inefficient at best! And then, all of a sudden, through the Magic that we so often experience in the Queendom, we received an almost unbelievably wonderful offer: A True Queen (“Truckin’ Queen”) and her Spud Stud Hubby (“Big Rig”), who just happen to have a whole bunch of big, giant trucks and trailers, advised us that they will haul a 53-foot 18-WHEELER FULL OF STUFF down there for us—FOR FREE! And more than that, they offered to send AS MANY TRAILER LOADS AS WE CAN FILL! This Queen and Spud Stud have already taken 3 full loads down there and they have worked out a SIMPLE PLAN to help US help The Cause. They received a List of the Most Needed Items from one of the major distribution centers in the affected area. We took the list to SAM’S CLUB and got a PRICE PER PALLET of each item. Each trailer will hold 26 pallets. We can purchase these items by the pallet-load from Sam’s, then Truckin’ Queen and Big Rig will cause trailers to back up to Sam’s and Sam’s will load ‘em for us. Then, Truckin’ Queen, Big Rig, and crew will drive them to the distribution center at the Gulf where the donations are off-loaded and easily accessible to the folks so desperately in need. Thanks to Truckin’ Queen and Big Rig, this whole process is easy for us, easy for the volunteers at the center, and easy for the hurricane victims. Win-Win-Win! These efforts are being coordinated through my home church, Wells United Methodist in Jackson, Mississippi. We are writing to ALL the churches of all denominations in the Jackson and Hattiesburg, Mississippi areas asking the Congregations to consider sponsoring a pallet or three of these essentials. And, I am asking you, individually, to consider making a donation of ANY AMOUNT to my church, in the name of “Wells United Methodist Hurricane Relief,” for this cause. Please share this information with any and all who might also consider helping us help these folks so hard hit by this hurricane. All donations are tax-deductible and I can tell you from very personal experience that my church WALKS ITS TALK—and that EVERY PENNY given for this effort will go directly and ONLY to this effort! To participate by check, please make it payable to: WELLS CHURCH HURRICANE RELIEF FUND and mail it to 2019 Bailey Avenue, Jackson, MS 39213. To donate online CLICK HERE Then click on “Pastor’s Fund for Hurricane Relief” and you’re set. 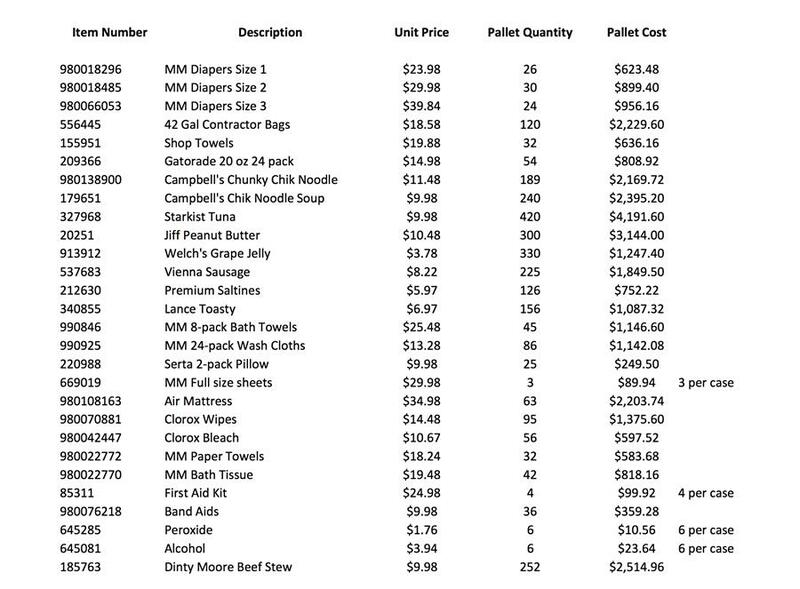 Below is the List of Most Needed Items and the per pallet price of each. If you or your Church or business would like to sponsor an entire pallet—that would be Ultra-Queenly of You and most appreciated!